The price of oil hit its all-time high in July of 2008, but since then has dropped by nearly 75 percent. Oil prices are now rising again and are likely to continue to climb as the world economy recovers. Oil man T. Boone Pickens believes that oil prices may reach $300 a barrel 10 years from now. History proves it, he said, and referred to the five OPEC revenue increases in the last five years. Why did oil prices rise last year to historic highs? And why are they rising again this year? Oil speculators are a favorite villain, but evidence supporting speculators as a major factor in price change is lacking. Speculators get blamed because people really don’t understand what speculators do, and how speculation works. “Speculators are often easy targets,” Lieberman and Foster continue, “because they seem to make money without working for it, and sometimes they make a lot of money. But professional speculators typically succeed by their wits, the sum total of their research, training, and experience, not luck. In so doing, they perform a vital role in financial markets: Speculators accept risk that somebody else does not want. The tried and true explanation for rising prices is a basic economic principle: supply and demand. When demand for oil goes up without the supply increasing, prices rise; people will pay what they must to get what they need. To control oil prices, or at least moderate the up-side price movement, the amount of oil on the market must increase; the more oil that is available, the lower the price. So to keep prices low and at the same time reduce dependence on foreign oil, rather than further regulating oil speculators Congress and the administration ought to incentivize American oil and natural gas companies to increase domestic production by removing bans, red tape and costly permitting processes so that they can drill in the areas where oil and gas supplies are most likely to reside, most of which are currently off limits. The American Petroleum Institute (API) believes that the massive new taxes and fees – totaling as much as $400 billion – that Congress is considering for the industry would reduce investment in new energy supplies when nearly two-thirds of Americans support developing domestic oil and natural gas resources, according to API’s Energy Tomorrow Web site. API believes this will cost thousands of jobs, cut into local, state and federal tax revenues, and further threaten our energy security. Since it is not yet sensible to shift to the so-called “green” energy sources, it only makes sense to maximize harvesting our own oil and gas supplies, thereby increasing the amount of oil and gas on the world market, and holding prices relatively steady, or perhaps lowering them. And, instead of restricting access to domestic oil supplies, bills like the American Energy Innovation Act (H.R. 2828), the No Cost Stimulus Act (S. 570 and H.R. 1431) and the American Energy Act (H.R. 2846) must be passed. These measures seek to increase domestic production by expanding and expediting offshore leasing and opening up promising onshore sites such as Alaska's Arctic National Wildlife Refuge, where it is believed 10 billion barrels of oil reside. We simply must abandon the ideological mania that puts the US in an ever more vulnerable position with regard to foreign oil suppliers, and do everything possible to utilize our own resources to solve these problems. And if we insist on obsessing on the role of speculation, the speculation we need to worry about is what our elected representatives in Washington are doing, risking our freedom, our economic well-being and our future by flirting with high-minded but impractical ideas, such as an forcing a transformation to infant technologies that are incapable of meeting the challenge, and may never be. 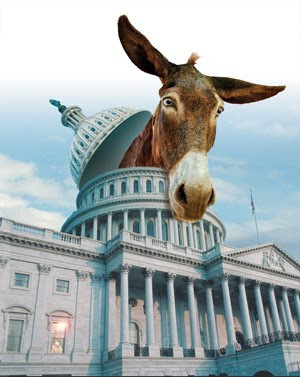 The problem with the Democrat leadership in Washington is that while their ideals seem wonderful in the abstract, they are abject failures in reality.